One minute, Milana Kashtanova is walking along the street in St. Petersburg, listening to her headphones and enjoying some music. The next, she’s in a coma. 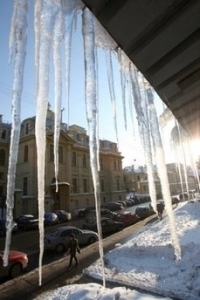 The culprit isn’t some mystery attacker, but rather icicles falling onto her head. It’s easy to laugh at, but it’s no joke. Thanks to a harsher than normal winter, five people have died and 147 people have been injured so far by falling ice and snow. Apparently, St. Petersburg is just one of many Russian cities turning into a war zone after Russia’s coldest winter in 30 years. Said citizen Boris Illinsky, “I’ve got to keep my eyes on the ground to avoid slipping and I’m also looking up to avoid falling lumps of ice.” A crew cleaning off the top of the building near where Milana walks says she ignored or didn’t hear warning shouts from them as they went about cleaning off the roof, but her family thinks there should’ve been some kind of warning sign up to prevent just such a disaster. Should there have been some kind of warning? Yeah, probably, but at the same time you’re responsible for your own well-being. If you can’t take care of yourself, nobody else can, either.